In recent years, Dykema has become known as a “go-to” firm for the full spectrum of legal and policy matters affecting the cannabis industry. But Dykema attorneys and lobbyists have been engaged in matters relating to the cannabis sector for a decade, long before we officially launched our Cannabis Law practice in 2016. As a full-service firm representing many businesses in heavily regulated industries, Dykema is exceptionally positioned to serve clients on cannabis-related matters. Dykema is widely admired for the quality of its work in practices such as regulatory policy, lobbying, administrative law and licensing, real estate, business services, and litigation, and our Cannabis Law team includes members from each of these areas, in our offices across the United States. Our work for clients directly involved in the business of growing and providing cannabis products is wide-ranging. It includes matters related to licensing and regulatory compliance; real estate; financing transactions; taxation; and payments and banking matters. Many of these issues also affect clients not directly involved in cannabis businesses, but that engage in one or more ways with such businesses. In this regard, we advise entities such as financial institutions, commercial landlords, and lenders. The cannabis industry presents exciting opportunities for established businesses as well as startups, as states and tribal governments have moved rapidly to authorize and regulate the cultivation, consumption and sale of cannabis for medical and/or recreational purposes. Yet, in particular, federal law remains a barrier. Among other effects, the constraints of federal law impact financial institutions’ ability to serve customers in the cannabis space and, in turn, for participants in the cannabis space to make and receive payments. And in 2017, as a new Congress and Administration take over in Washington, the regulatory landscape is more uncertain than ever, and may become even more trying on the federal level. At the same time, we foresee opportunities as well as challenges in this space, and have a top-flight team of professionals ready to help our clients come out ahead. 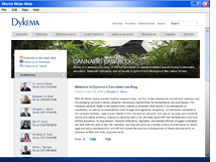 The members of Dykema’s Cannabis Law team come from a wide range of practice areas, including administrative law, business and financial services, food and beverage, government policy and practice, healthcare, Indian law, insurance, intellectual property, land use and zoning, labor and employment, leasing and property management, political compliance, elections and campaign finance, product safety, real estate, and taxation. With a bipartisan group of lawyers and registered lobbyists, as well as extensive relationships with lawmakers at the state and federal level, Dykema has a history of assisting cannabis-related clients with their political objectives. On behalf of clients, members of our Cannabis Law practice have played critical roles in establishing and helping to influence the creation and modification of state and local cannabis systems. In 2008, as counsel for the Coalition for Compassionate Care, Dykema helped draft and secure the overwhelming passage of the successful ballot initiative that created the Michigan Medical Marihuana Act, which was approved by Michigan voters by a more than 35 percent margin. Dykema attorneys and lobbyists were central to the passage of Michigan’s Medical Marihuana Facilities Licensing Act in 2016. In Illinois, we have been involved in lobbying and licensing application work for cannabis industry investors. We continue to lobby on behalf of cannabis associations and business clients today, representing cannabis-related clients in state and local legislative matters, educating lawmakers on cannabis-related issues, and testifying on cannabis-related proposals before state legislative committees and city councils. Dykema has also been involved in helping to draft a number of local ordinances regarding cannabis. When it comes to licensing and regulatory matters, Dykema is uniquely positioned to assist cannabis-related clients. This is not the first industry in which Dykema played a lead role in citizen-led initiatives and the development of a regulatory regime—we built our casino gaming practice through the same type of early-stage involvement, starting with the development of a legislative and regulatory framework in Michigan and exporting that expertise to multiple other states. Dykema attorneys have worked extensively with states to draft legislation and administrative rules in highly complex and highly regulated areas. As states continue to create cannabis-related regulatory structures, our experience with creating and working through the entire life cycle of regulated industries, combined with our cannabis-specific legal expertise, makes us an effective and strategic partner in the rulemaking process. Moreover, as state and local governments continue to enact heavily-regulated cannabis systems, we are able to assist clients with initial licensing applications, just as Dykema professionals recently did for a business seeking a dispensary license under the Illinois Medical Cannabis Pilot Program. And, our extensive experience in heavily-regulated industries, such as liquor and gaming, gives us the background to work with cannabis-related businesses and associations to assist in crafting programs to ensure that clients are in compliance with existing rules and regulations, or to work with clients to urge the creation of new rules or regulations. Long known as one of the largest and respected Real Estate groups in the Midwest, Dykema’s Real Estate practice has become one of the most highly regarded practices in the country. Our attorneys represent clients with regard to the full array of real estate matters, including acquisition, construction, zoning and land use, leasing and property management, financing, workouts and bankruptcy, regulatory compliance, and litigation. Real estate matters particularly relevant to our Cannabis Law practice include commercial leasing of space to cannabis businesses and obtaining payments from such tenants. Banking and payments issues have become among the most pressing for participants in the cannabis industry: conducting business is difficult, to say the least, when money cannot be moved from one party to another through the usual banking and payments channels. And financial institutions themselves face daunting risks in attempting to serve customers in this space. To help clients navigate this reality, we offer a world-class team of former banking regulators and other attorneys widely recognized as leaders in financial institutions regulation, payments systems, and Bank Secrecy Act (BSA)/anti-money-laundering (AML) compliance. Our team includes attorneys that have held high-level positions at banking and securities regulatory agencies at the federal and state level. We understand the supervisory framework as well as the laws and regulations themselves, so that we may provide counsel not only on relevant laws and regulations, but also the risk landscape and the evolving regulatory outlook. In particular, BSA/AML issues are of concern, and our team is particularly well-versed not only in the ins and outs of the BSA, but also the way that regulators and law enforcement officials look at AML. Our attorneys include those that hold the Certified Anti-Money Laundering Specialist (CAMS) designation. Cannabis-related businesses not only face the same challenges that every business must face, but also incur additional hurdles related to the interplay between state and federal law with regard to cannabis. Our attorneys have extensive experience assisting businesses of all sizes with every aspect of the business life cycle, and the full range of these services is available to cannabis-related clients. More importantly, however, our attorneys not only have broad experience in providing legal representation to businesses, but they also have specific experience in working with cannabis-related businesses. Businesses in the cannabis space face privacy and data security issues relevant to many businesses of other types, as well as those specific to the healthcare sector. Our Privacy & Data Security attorneys bring to the table experience and knowledge of sectors and practice areas such as information technology, financial privacy, intellectual property, and health privacy and security. Several of our attorneys hold the CIPP certification, which represents the “gold standard” credential for privacy professionals. With regard to patient healthcare information, Dykema’s interdisciplinary team of lawyers provides the full range of customized services and solutions for compliance with the Health Insurance Portability and Accountability Act (HIPAA) and the 2009 Health Information Technology for Economic and Clinical Health Act (HITECH), which was operationalized in January 2013 with the promulgation of an implementing Omnibus Rule. Our services include counsel on HIPAA requirements; preparation for and assistance with government HIPAA audits; assisting clients in responses to complaints and government HIPAA investigations; drafting and reviewing HIPAA and HITECH forms, policies, procedures and business associate agreements; designing and implementing HIPAA compliance plans; training staff; developing breach response plans; and managing HIPAA-protected information in litigation. Represented proponents of Michigan Proposal 1 of 2008, creating the state’s medical marijuana system. Helped draft Michigan Public Act 512 and Public Act 514 of 2011, which amended the Michigan Medical Marihuana* Act. Advocate on behalf of a medical marijuana association with regard to legislation to create a regulated medical marijuana dispensary system in Michigan. Lobbied on behalf of a seed-to-sale tracking company. Provided advice with regard to labeling regulations for edible cannabis products. Counseled cannabis-related clients with regard to intellectual property laws, including trademarking names and logos for cannabis-related businesses. Advocated on behalf of an entity seeking a medical marijuana dispensary license in Illinois. Served as counsel to medical marijuana organizations seeking to influence local zoning ordinances in Detroit and Lansing, Michigan. Oversaw zoning and real estate matters for an Illinois-based dispensary company. Represented California business on business structure and capital raising activities. Represented a company with cannabinoid medications in pharmaceutical litigation. Counseled various business clients with regard to employment matters and policies related to employee cannabis use. Assisted various cannabis-related organizations with nonprofit and campaign finance compliance. Advised investors in dispensaries and CBD oil companies. Handling SEC-related issues for cannabis-related business executive. "Weighing Investments in an Exploding New Industry"